Once configured, when you choose a plan while creating a subscription on the web interface, the addons are attached automatically. We show below a sample checkout summary for the Scale plan. The addons have been attached automatically and their prices are shown. You can either allow all addons to be applicable to the plan or click on Manage to restrict them to a few or none. Recurring and non-recurring addons are treated distinctly while associating them to plans in Chargebee. When set as mandatory, the addon is automatically attached to new plan-activations and cannot be removed (except via API ). The quantity cannot be edited either. If a subscription changes to another plan with which the addon is not mandatory, the addon is removed from it. When set as recommended, the addon is attached to the plan unless explicitly removed. In upcoming releases, a recommended addon will be suggested with the plan during Checkout, in the Self-serve Portal and on the Chargebee user interface. Designating an addon as optional allows it to be attached to the subscription. 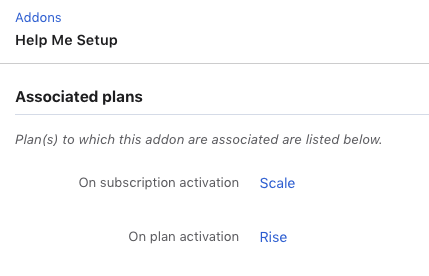 Once an addon is attached to a plan as recommended or optional, it can then be added to any of its pre-existing subscriptions via the change subscription action. A non-recurring addon can be set to automatically attach to the subscription once or each time a certain event occur(s). For gift plans, you can only associate non-recurring addons on-demand. Event-based applications are not possible. The add addon action at the customer level can be used to add any non-recurring addon regardless of how addon applicability is configured. Subscription creation: Whenever a new subscription is created in Chargebee. Note that if a subscription is created today and set to start in the future, the subscription creation event is said to have happened today. Subscription trial start: For plans with trials, the time when the trial starts. 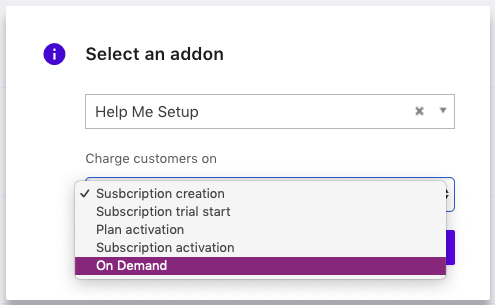 If you wish to charge your customers a fee for the trial period, you can create a non-recurring addon for it and set it for a plan to be charged on subscription trial start. Subscription activation: Whenever the subscription status goes active. This includes reactivations. Choose the Apply charges option as Every time this event occurs if you wish to include the addon during subscription reactivations. Plan activation: This includes all cases under subscription activation and the case when the subscription undergoes a plan change. Assume a plan ABC with a non-recurring addon Activation fee attached to it, set to be charged on plan activation. If the plan of a subscription is changed from any other to ABC, this addon would be immediately applied to the subscription. 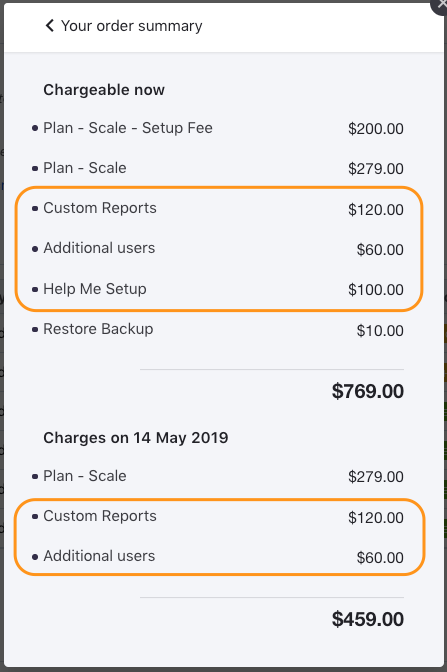 Now, if the plan is again changed to something else and then switched back to ABC, the addon is only applied if the Apply charges option for it is set to Every time this event occurs in the details page for ABC. Plan and addon association can be viewed at two places in Chargebee. All the applicable addons for a particular plan can be seen on the details page of the plan. Similarly, the details page for an addon shows the plans that it is associated with.